Can't find an answer to your question below? Click here to send your question! How do I play American mah jongg? How do I see the discarded/thrown tiles? How do I see how many tiles are remaining in the wall? How do I trade for an exposed joker? How do I chat with other players during a game? How do I use private tables? How do I add or remove computer players from my table? I think my hand was ruled invalid in error. I can't see all of my tiles because of the bar on the right. There are too many popup messages. Why did the game display a "Connection Status" popup window? The game is frozen with a "Stand By..." message. Why do the bots get more jokers than me? Why do I rarely receive multiple jokers? How do cards work on MyJongg.net? Why is the "Card" tab in the game blank? Why are some exposed jokers faded with a red border? What is the tile that looks like a red sword? How do you earn points? What are the scoring rules? What do I do if I find a bug or have a suggestion? How much does MyJongg.net Premium cost? Why can't MyJongg.net be free? How do I start a table with Tile Tutor? How do I use Tile Tutor? How do I use the Training Room? How do I access my stats and game history? How do I view, update, or cancel my subscription? MyJongg.net is a great place to learn if you are new to the game! I'd recommend getting started by playing against the computer players before jumping into a game with other people. If you are still learning to play or looking for tips and tricks to become a better player, I highly recommend "Let's Play Modern American Mah Jongg! A Flipbook Reference Guide" from 26th Avenue Press. This is a fantastic reference to keep with you at the table! You declare Mah Jongg and your hand doesn't match any hand on the card that you are playing. You declare Mah Jongg and your hand matches a hand on the card that you are playing, but the hand played was concealed and you had previously exposed a set of tiles. You expose a set of tiles and your exposed sets don't match any hand on the card that you are playing, or they only match a concealed hand. If you had previously exposed tiles, check that the hand you were attempting is not concealed. Check to make sure that the suits match the rules described on the card for that hand. For example, if the card calls for "two suits", make sure that your hand doesn't consist of a single suit or three suits. Check to make sure that you haven't confused two tiles that are similar in appearance. For example, the 1 dot tile appears similar to the joker, and the 1 (bird) bam looks somewhat like the flower. On the 2016 National Mah Jongg League card, pay special attention to the fact that the 333 66 999 333 333 hand specifies "like pungs 3, 6, or 9". This means that whether you choose 3, 6, or 9 for the two matching pungs, they MUST BE THE SAME SUIT. This means, incidentally, that you need at least two jokers to complete this hand. MyJongg.net has two kinds of cards: full and "BYOC" (Bring Your Own Card). Tile Tutor -- Have you ever wanted to have an experienced player giving you advice on which hand to play? Tile Tutor constantly analyzes your tiles and recommends the best section of the card as well as the best hands, showing you a breakdown of the tiles that you need as well as the Tile Tutor score, an overall measure of the quality of your hand. Training Room -- Earn points while sharpening your skills and learning to better recognize hands! 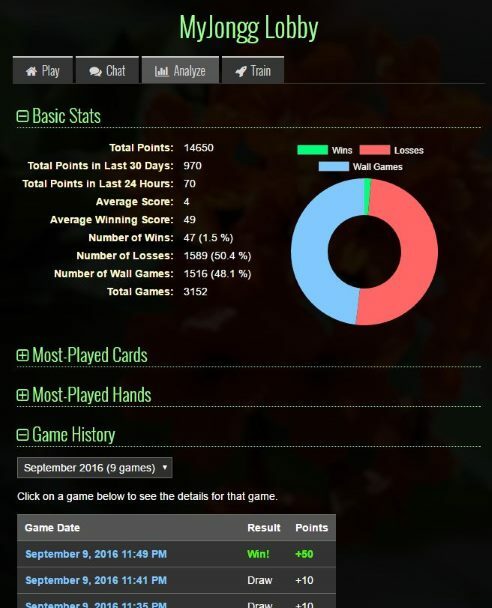 Detailed Stats and History -- See your win, loss, and draw percentages, see all the details of your past games, and broaden your knowledge of the cards and hands that you play to analyze your tendencies. Unlimited Play -- Premium members will not be limited to a certain number of games per day. More! -- While every player on MyJongg.net is important and valued, MyJongg.net Premium players will get early or exclusive access to some new features as they are made available! In addition to the features above, subscribing to MyJongg Premium will help support the game and keep it advertisement-free! The "Card" tab in the game is blank...why? MyJongg.net has its own card (the MyJongg.net Starter Card), but respects the hard work (and copyrights) of others who publish cards. For that reason, only the MyJongg.net card is available from within a game. For other cards, you'll need to purchase your own copy in order to play. For example, MyJongg.net is not affiliated in any way with the National Mah Jongg League and therefore can't include their card of hands. If you are playing on a device with a smaller screen (such as an Apple iPad), it is probably necessary to keep the sidebar on the right closed (unless you need to refer to it) while playing in order to see all of your tiles. To show or hide the sidebar, just click on the vertical gray bar on the right edge of the screen. To view the tiles that have been discarded, you'll first need to make sure that the sidebar on the right is open. You can hide or show the sidebar by clicking on the vertical gray bar along the right edge of the screen. Once the sidebar is open, just click on the "Discards" tab. The tiles are grouped by suit and then by number. The number of each tile that has been discarded will be shown below the tile. If all tiles of a particular type have been discarded, then the tile will be faded out and the count will be shown in red. MyJongg.net Premium - Monthly $4.99 1 month Less than a trip to the coffee shop! MyJongg.net Premium - Quarterly $12.99 3 months Only $4.33 per month! MyJongg.net Premium - Semiannually $22.99 6 months Only $3.83 per month! MyJongg.net Premium - Annually $39.99 12 months The best value...only $3.33 per month! All amounts are is US dollars (USD). Why can't MyJongg.net be completely free? Why a limited number of free games per day? There is a cost to keeping MyJongg.net up and running. As the number of players increases, so does the cost. I would like MyJongg.net to be self-sustaining so I can continue to improve the site and add new features for a long time to come! I would also like to avoid relying on advertisements which ruin the experience for everyone. As promised since the site began, you will always be able to play for free. You'll simply be limited to four free games per day. That number was chosen because four games is "once around the table". The free game counter resets each day at 3:00am U.S. central time. The gauge across the top of the game board shows the number of tile remaining. It also becomes smaller and changes colors from green to red as the game progresses. The "Discards" tab in the sidebar on the right also shows the number of tiles remaining. The number of popup messages that appear from the top-left corner of the screen can be customized by changing the appropriate setting in the "Settings" popup while playing. Note that if the sidebar on the right is open to the "Chat and Messages" tab, then no popup messages (other than errors) will be displayed regardless of the setting above. This is because there are no longer sufficient tiles in play to trade for that joker. For example, in the screenshot above, five other flowers have already been discarded. This means that only one of the exposed jokers is available for trade while the other is "dead". Some players do this when playing at a real table by turning the exposed joker upside down. What is the "red sword" tile? That is the red dragon tile. This is a common way of representing the red dragon. It was chosen because -- unlike all of the other tiles (which are distinguishable by number or letter) -- the red and green dragon tiles would otherwise differ only in color. This would make playing difficult for those who have a color vision deficiency. Building and breaking the wall (as well as dealing and drawing from the head) are artifacts of playing at an actual table with physical tiles. The wall is therefore more of a "ritual" than a rule. It is not necessary on MyJongg.net, as the tiles are thoroughly randomized for each game. To see how many tiles are remaining in the wall, click on the "Discards" tab in the sidebar on the right. You may receive a popup window indicating that "Your connection to the game was lost". This means that for some reason, MyJongg lost its connection to the server. The "Connection Status" window means that an attempt was made to rejoin the game. However, depending on how long the connection was inactive, the game may have been already closed, making it impossible to rejoin. The popup window will indicate whether the connection could be restored or not. You are playing on a mobile device like an Apple iPad (as opposed to a laptop or desktop PC) and you closed the web browser, switched to another app, or allowed the screen to lock due to inactivity. This causes iOS to suspend the web browser to save battery life, which closes any active connections. Select (by clicking or tapping) the tile in your hand that you would like to trade. Select the exposed joker for which you would like to trade. 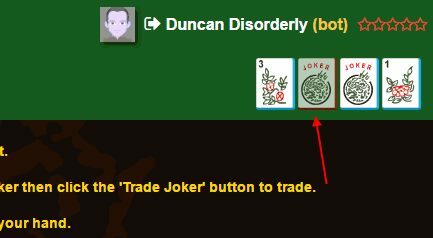 The "Trade Joker" button should now be enabled. Click it. Note that you can only trade for a joker on your turn. To trade for more than one joker, simply repeat the steps above multiple times. In order to use Tile Tutor, you must start your table using the "Start a New Table" button (not the "Just Play" button) in the lobby. When you enable Tile Tutor, scoring is automatically disabled, so you will not score any points or receive credit for any wins for games played with Tile Tutor. Tile Tutor will be enabled for all players with a MyJongg.net Premium membership who join this table. Those without a membership will still be able to join the table, but they will not be able to access Tile Tutor. A 2x bonus is awarded for winning with a pure hand (no jokers used). A 2x bonus is awarded for drawing your own winning tile. A 2x bonus is awarded for trading for an exposed joker that is used to win. A 10-point bonus is awarded for winning on the last tile in the wall. A 10-point penalty is charged for discarding a tile that is claimed by another player to win. 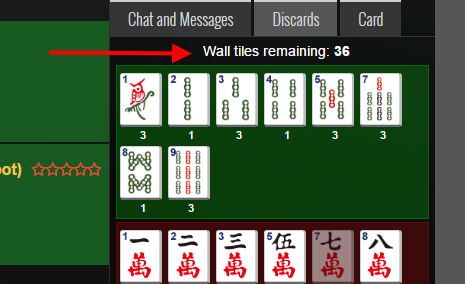 If a hand ends in a wall game (a draw due to no tiles remaining in the wall), all players receive 10 points. How do I use Tile Tutor at the table? Once your Tile Tutor-enabled table has started, you can access the Tutor by opening the sidebar on the right and switching to the "Tutor" tab. The "Best Sections" area looks at the number of hands in each section of the card that match your tiles and recommends the top three sections. This gives you an area of the card in which to focus. The "Best Hands" area lists the top three matching hands for your tiles. The yellow number next to the hand is the point value for that hand as shown on the card. You can expand or collapse each hand by clicking on the blue plus/minus button. The hands recommended by Tile Tutor do not take into account tiles that have already been discarded, so hands that can no longer be completed may be recommended. Sort Like This - This button orders the tiles in your actual hand to match this recommended hand, with needed tiles on the left and unneeded tiles on the right. Matching Tiles - This shows the tiles needed to complete the chosen hand. The numbers below each tile indicate how many of that tile you have out of the total needed. Red numbers indicate that you do not have any of those tiles. 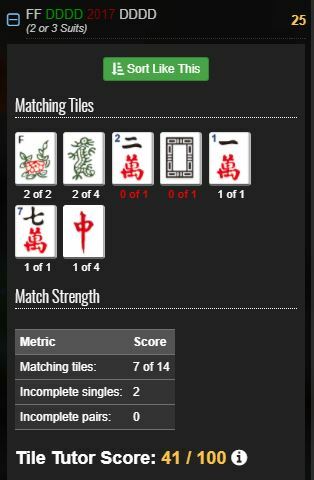 Match Strength - This shows the total number of matching tiles that you have in your rack as well as the number of needed singles and pairs. These numbers are important because they impact your ability to complete this hand. Game is frozen at "Stand By..."
I apologize if you run into this problem. I'm working on finding and fixing problems that can cause the game to become unresponsive. Unfortunately, I haven't been able to track down the cause of this particular issue yet. If your game gets stuck, you can try clicking on the "Refresh Table" button in the "Settings" popup window. What kind of device are you using to play (e.g. desktop or laptop PC, iPad)? On that device, what web browser are you using (e.g. Internet Explorer, Safari, Google Chrome)? Do you experience this problem when playing alone with computer players, with other human players, or does it happen in both circumstances? Use the feedback page to report bugs or to send suggestions. They are both appreciated! To chat with other players during a game, first make sure that the sidebar on the right is open. This help article explains how to open and close the sidebar. Once the sidebar is open, switch to the "Chat and Messages" tab. Click or tap the text box at the bottom of the tab, type your message, then click the "Send" button or press the ENTER key. Private tables allow you to play (either with friends or against the computer opponents) without your game appearing in the lobby. Players will need to know a code to join. Once you are at the table, you should have a button labeled "Game Code" that will show you the code necessary to join the table. You can then share this code with your friends via text message, email, or some other means. Please note that this code is specific to this table only. If you leave and/or create a new table, this code will not work. If you were given a private table code by someone else, just click the "Join a Private Table" button in the lobby and enter the code you were given. You should then be taken to the private table. The training room is started from the "Train" tab in the lobby. Click on the "Start Training!" button under that tab to get started. Follow the prompts on the next screen to start your training session. 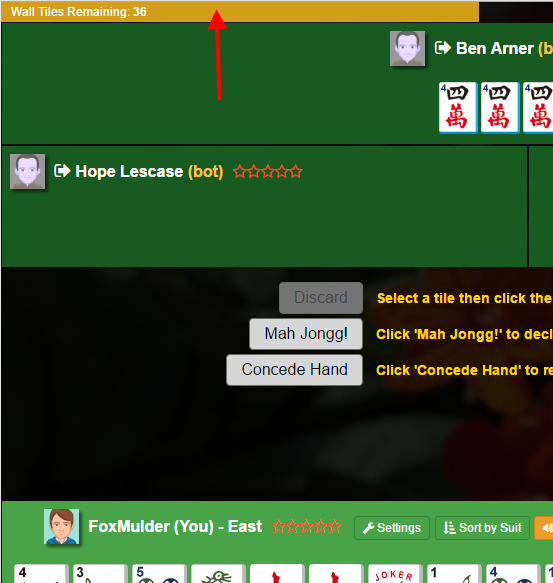 The training room works by showing you a winning Mah Jongg hand from the chosen card with one tile missing. You must then choose the tile that completes that hand from the grid of tiles below. You don't compete directly against other players in the training room. Your "training points" are kept separately from your points earned while playing at the actual tables and can be seen on your profile page. The tiles (including the jokers) are completely random and the game does not favor computer players or humans. Every player has an equal chance of drawing jokers from the wall on their turn. If you are playing at a table against three computer opponents, they are three times more likely to win simply because they outnumber you three-to-one (not taking relative skill into account, of course). Jokers increase the chances of winning, so winning hands are naturally going to tend to contain more jokers. You see the winning hand at the end of each game, but don't see the other hands that likely had fewer jokers. Games played "in real life" at an actual table where the tiles are shuffled by hand are likely not as random. This can lead to "bunches" of jokers in the wall. When you become accustomed to this joker distribution, a truly random wall can feel "wrong". A complete history of your games is kept by MyJongg.net. Your Premium membership gives you access to those games, as well as statistics about your wins, losses, and hands played. To access this information, open the "Analyze" tab in the Lobby. The "Basic Stats", "Most-Played Cards", and "Most-Played Hands" sections give you information about your performance and tendencies. The "Game History" section shows a list of months and years in which you have played. Choosing a month and clicking on the "Load Games" button will show you all games completed in that month. Clicking on a date in the resulting table will open a snapshot of that game in a new browser tab or window. If you are playing at a table that you created (or you are the player who has been playing at the table the longest), then you can add or remove computer players from the game. To add a computer player, click or tap the "Add Computer Player" button above your tile area and confirm when asked in the popup message. Note that if a game is currently in progress, this button will not be available. To remove a computer player, click or tap on the arrow icon next to that player's avatar and confirm when asked in the popup message. Be aware that removing a computer player from a game in progress will end that game. I live in Oklahoma with my wonderful wife, two kids, and two dogs. I'm a software developer by day. I learned Mah Jongg a few years ago (thanks to my favorite mother-in-law) and started to work on the site in my spare time when I saw that there weren't a lot of options for playing American Mah Jongg online. 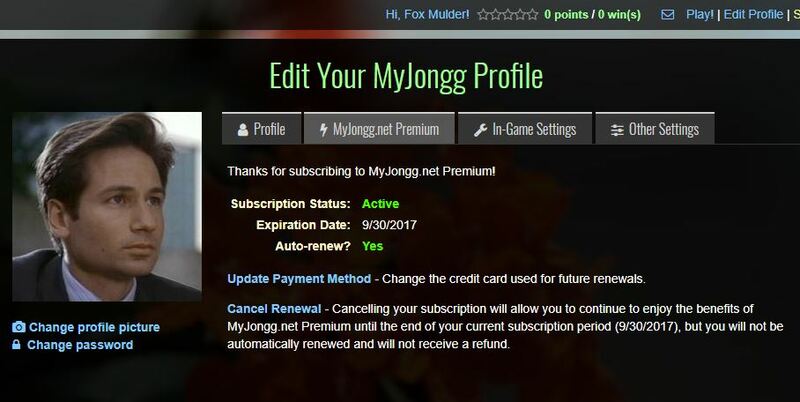 You can see your subscription status, update your payment method, and cancel your subscription from the "MyJongg.net Premium" tab on your profile page. Note that all sales are final and no refunds will be issued. Refunds are not offered because there is really nothing to "return" (you will continue to have access to all of the Premium membership benefits until the expiration date) and MyJongg.net has limited customer service resources. Background image is courtesy SwamInathan; used with modifications under the Creative Commons license. Tile images are used with permission from Yellow Mountain Imports. Their American mahjongg tutorial is excellent as well! No recent games were found for this player.